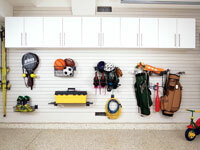 Imagine having a place to store the endless amount of junk cluttering your garage... It's here, right before your eyes! 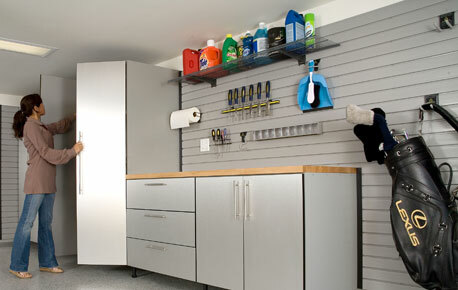 Garage Envy's patented WallScape™ slatwall system allows homeowners to store items anywhere in the garage to maximize space for cars. 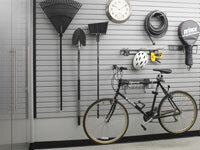 Utilizing a universal wall mounting system and a heavy-duty Polyvinyl Chloride (PVC) composition, WallScape™ transforms walls into complete storage areas. 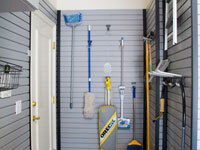 Every inch of the horizontal panels can be used to store items such as hand tools, bikes, garden equipment, wheelbarrows, fertilizer and ladders — with shelves, racks and all manner of other accessories. Unlike the wood or flimsy slatwall systems that others offer, WallScape™ is waterproof, fire-resistant, UV protected and unbelievably strong. You never have to paint WallScape™, it won't mark car doors, and you can rearrange the hanging accessories whenever and however you want... it's easy! Call Us Today 888-248-8544 for Free Design Consultation & Free Estimates.